7. 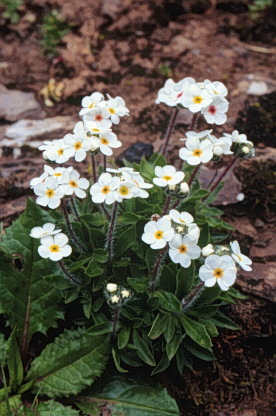 Androsace Linnaeus, Sp. Pl. 1: 141. 1753. Herbs perennial, annual, or biennial, acaulescent, rarely caulescent with ascending or decumbent shoots from a caudex. Leaves forming a rosette, rarely alternate; rosettes solitary or clustered, forming lax mats or compact cushions. Inflorescences umbellate, rarely a solitary flower, with bracts. Flowers 5-merous, homostylous. Calyx campanulate to subglobose, shallowly to deeply lobed. Corolla white, pink, purple, or dark red, rarely yellow; tube usually ± inflated, ca. as long as to shorter than calyx; throat constricted; lobes entire or emarginate. Stamens included, inserted on corolla tube; filaments very short; anthers ovate, apex obtuse. Style not longer than corolla tube. Capsule subglobose, dehiscing nearly to base. Seeds few to many. Approximately 100 species widely distributed in temperate regions of the northern hemisphere; 73 species native to China.